I will say again that it is amazing how much excellent works is being produced by writers all over America. This week we post the second in a short series of reviews of works by ‘local’ authors on the Monterey Peninsula. Brilliant. 5 star. Need I say more? Well, actually yes, I do. ‘Steinbeck: The Untold Stories’ is a small masterpiece. Only ‘small’ in the sense that it is a slim volume, but comprised of a great number of stories, all economical and precisely penned. 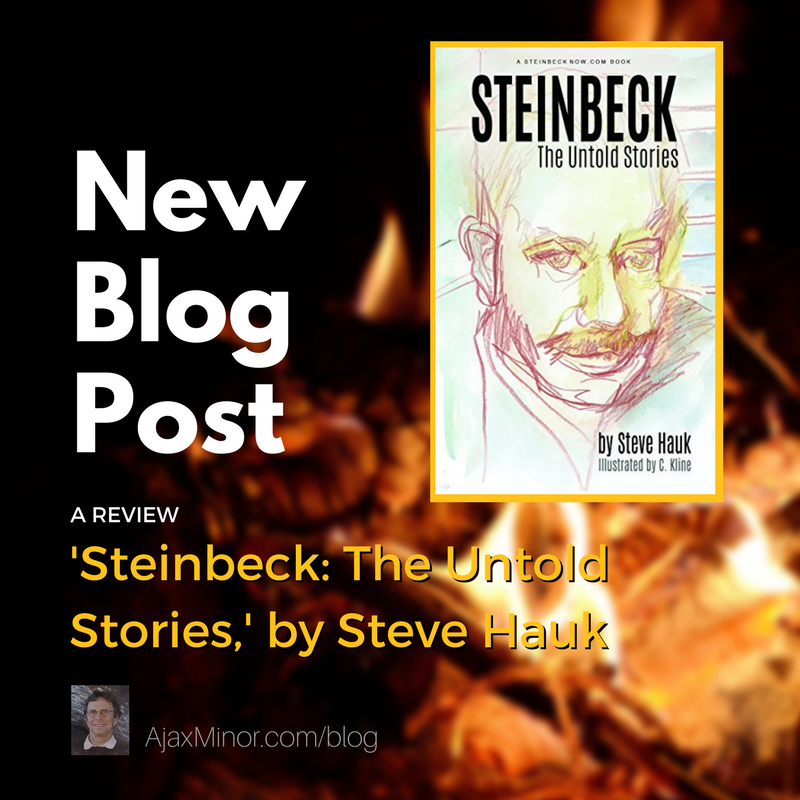 The stories are Hauk’s fictional accounts of real incidents and real people in the life of John Steinbeck, on whom he is an expert. Hauk’s voice is consistent throughout. It is easy, conversational, as if you were sitting in his living room, or better yet, around a wood stove in an old, local general store. But the color of each story is different, depending on the personalities and background of the central characters. Colin McCann in his ‘Letters to a Young Writer’ claims that language drives a story. I write, as Ajax Minor, and have never thought of language as the life’s blood of a book. But after reading Hauk’s ‘Stories’ I’m not so sure I’m right in all cases. The brilliance of Hauk’s stories is that each is shaded in the language of the protagonists, from the first, ‘John and the River,’ about ‘kids’, to the immigrant ‘Olie’ and on to Steinbeck himself, ‘The Gaunt Visitor;’ the former sounding as if coming from the mouth of a 10 year old, the latter dark, Steinbeck in his later years. And there are housepainters, drunken disappointed wives, gas station owners, the lot. The book is delightful and a great read, at your leisure over a few weeks, or all in one bite!